'The Camp' as it is more usually known is set in about 15 acres of woodland just off Storeton Lane and has grown out of all proportion to its early days at the turn of the last century when it was known as, Scott�s fields, or the Picnic Grounds. 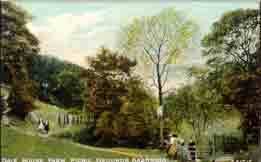 Originally it consisted of a tearoom and picnic centre, later roundabouts and a very long slide were added. 'The Camp' has been in existence for over one hundred years, today it is a Charitable trust providing outdoor activities for both young and old with sleeping accommodation for 120 people. To find out more about 'The Camp' today click HERE. Early advert for 'The Camp' In its hey day between 1900 and the late 1930�s, it was a favourite for special treats and Sunday school outings. Visitors to the camp would arrive for outings and Sunday school trips from far and wide by train, bus or horse drawn wagon. Rail passengers alighting at Storeton-for-Barnston station just 500 metres away, visitors who arrived by horse drawn flat top wagons would have the horses stabled at Bank farm until required for the return journey. One of the visitors from that time had this to say �scarcely a day passes in summer on which a party is not booked for this ideal place � the hills, dales and woodland scenery being a great attraction. Cards like the one on the right bore a wide variety of messages. 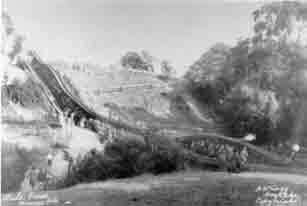 In time the Camp lost its slide and fairground appearance, in 1948 it was opened as a residential camp by Liverpool Boys Association, and for a time was used by the Y.H.A. at that time the accommodation consisted of four dormitories sleeping 88, and 8 twin rooms usually occupied by the leaders. For a time the Camp was also home to the village school. In 1949 the old school attached to the Church (now the Church hall) had become unfit. 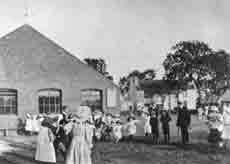 The school was transferred to the camp prior to the opening of the new school in Sandham Grove. When the school moved out it was used for teacher training and as an outdoor activities centre.